There are exactly six Oktoberfest beers. There might be a couple more if you can find an authentic dark version at one or two of the tents, but we don’t think the darks are even offered any more. The “Big Six” of Munich have arranged (conspired?) to ban any beer that is not brewed in Munich from the fest. When smaller brewers built Munich breweries to try to get a piece of the lucrative sales, the law changed to “grandfather out” any new brewery. In fact you have the choice of only four breweries now that Spaten and Lowenbrau have merged (and sold out to AB InBev). Paulaner and Hacker-Pschorr are owned by the same holding company – one that’s 49% owned by Heineken. The two remaining truly Munich breweries are Hofbrau, which is owned by the State of Bavaria and Augustiner, which is owned by a private foundation—and almost operates as a charity. Here are a half dozen American Oktoberfest-style beers that that are reasonably easy to get. Beyond that this list includes a range of sweetness, authenticity (“Echt”), and complexity You can use these to celebrate all the “Octoberfest” celebrations that in America occur in October instead of the true fest’s September timing. Yuengling’s Octoberfest is very sweet, but it’s clean. It tastes to us like a stepped up version of their lager. We think if you like the lager, you’ll be fine with this, and the price is an incentive. D.C Brau is one of our favorite breweries and one of only a handful for which we’ll buy a full six pack to be able to try a new offering. But their Oktoberfest this year seems unusually sweet with caramel almost to the point of sugar. Straub Oktoberfest – You’ll probably have to go to Pennsylvania to find this one, but if you’re in Pennsylvania, Straub beers can be found in supermarkets and the like in many parts of the states. Straub is one of the last independent 19th century regional/local brewers started by immigrants in the backwaters of Pennsylvania to slake the thirst of other immigrants. We love the old brewery, and we used to love the flagship lager when we were young and sweet-happy. In recent years, the brewery has added a range of specialty products. This Oktoberfest is sweet – the upstate Pennsylvania demands that—but soft herbal hops and even a hint of fruit give it a pretty nice breadth. Sierra Nevada collaborates with a different German brewer each year to produce it’s Oktoberfest. This year the brewer is Miltenberger, a decent German brewer, but located a long 350 kilometers from Munich. The color is an authentic rich gold, it has chewy rich malt and slightly more bitter at the end than the real deal. It’s not the smoothest beer they’ve ever brewed, but it’s not bad. Last year’s version, brewed with Bamberg’s Mahrs Brau, was much more complex and interesting, though. Heavy Seas brews an Oktoberfest that Ellie calls “echtly risky” – 6% abv and very easy to drink. The sweetness is almost balanced by herbal and slightly fruity hops. Peak Organic from Portland Maine, is usually available in the same distribution markets as Shipyard beers. Their Hop Harvest Oktoberfest is decidedly hoppy for the style, though there’s some chewy malt underneath. It’s unusual to find a hoppy fest beer anywhere in Germany, but this very American entry accompanies a range of foods well. We’ll have more to say about the following two beers in a subsequent post. Neither is widely available away from the brewery. Mad Fox ‘s Hitzig Frau Festbier is another winner this year. It leans towards the modern style and has better balance than most. At a recent Oktoberfest beer tasting, it was more popular than Spaten’s version. 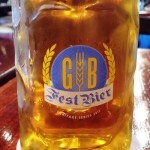 GORDON BIERSCH ROCKVILLE’S FESTBIER: SULTAN SWATS THE MODERN OKTOBERFEST STYLE OUT OF THE PARK! A disadvantage of teaching is that we’ve been to the actual Oktoberfest only once. On the other hand we’ve had lots of summer days to explore local fests all over Germany. I wish we had counted the Volk and Schutzen fests we’ve been to – it’s many dozens– and each one featured a local brewery’s fest bier. Thirty years ago we encountered a good many fest biers that mimicked the dark Oktoberfest style, but many were lighter in color and less cloyingly sweet in a night of overindulgence. 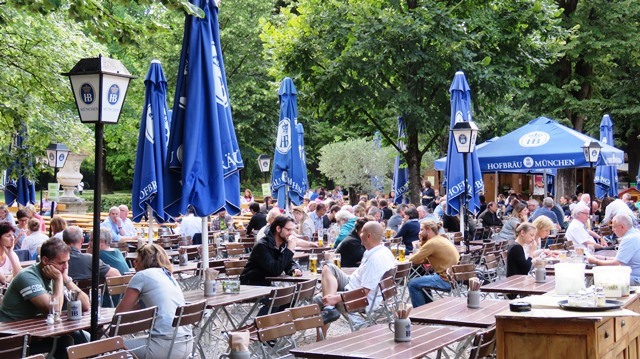 We think some of those local gems might have influenced the “big six” of Munich to a more balanced approach to the beers served in their massive tents. The beers of Munich’s Oktoberfest have shifted dramatically in the “light” direction – color and balance, though no lighter in body. These lighter cleaner fest beers are sometimes hard to find in America. We know of one major festival that sent back an entire shipment of genuine Oktoberfest bier because the organizers “knew” it was supposed to be darker. The brewery resolved to never let the real stuff cross the Atlantic again, and we think, 25 years later, they haven’t. But you can get a remarkably authentic Oktoberfest beer that didn’t have to cross the pond. Over a thousand American craft breweries (OK we really haven’t counted, but we’d bet money it’s over 2,000) brew a fest beer, and while some of them are under-aged attempts at the old style dark Märzen, others match the real deal better than many German-brewed non-Munich copy cats. We’ll feature Mad Fox’s Hitzig Frau before we leave this theme; tonight we’ll look at another Mid Atlantic marvel. We’re writing this post at the Gordon Biersch in Rockville, Maryland. Head Brewer Nassim Sultan had some big shoes to fill when he replaced Christian Layke who was moving on to start up his own brewery, and he’s filled them very well indeed. We’ve featured some of his other winners in the past in this blog, but his Festbier this year is one of the best beers he’s done. It’s a rich gold, like the beers you’d have gotten in the big tents if you had been there last week. The 25 IBUs clean the sweetness beautifully and make it achingly moreish. At 5.7%, it can get you in trouble over the course of an evening, but even there he’s got an edge – the beer in the tent in Munich is likely to be a deceptively dangerous 5.9. 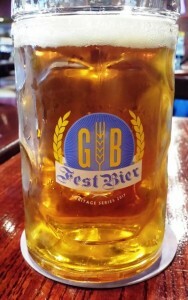 NEXT (OKTOBER 8) WE’LL FEATURE MORE FESTBIER! 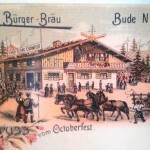 Many American visitors to Oktoberfest are shocked to find the beers a pale gold color – about that of a deep Helles and not that much darker than most pilsners. In the US, Spaten, at least, avoids the culture shock and sends over a version of their original dark version of the style, sometimes labeled Ur- Märzen, “Ur” meaning original and “Märzen” referring to the original March fest beer. 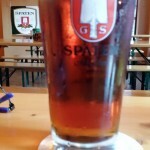 The Märzen style originated because beer could not be successfully brewed in the warmer months, though ice caves allowed for it to be stored quite successfully. Spaten’s historic, rather than authentic, Oktoberfest at Tyber Bierhaus in Bethesda, Maryland. The dark Märzen would have been expected in the 19th century when it became the dominant beer in Oktoberfest. 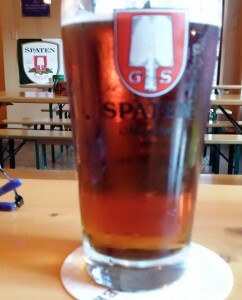 Spaten claims to have originated the style and the evidence seems to support the claim. Spaten was one of the breweries that pioneered lager beers, and it had close connections to Vienna, where amber beers were emerging at the time. Tastes change, though, and when we visited Oktoberfest in 1989 the dark version of the style was already on its last legs. 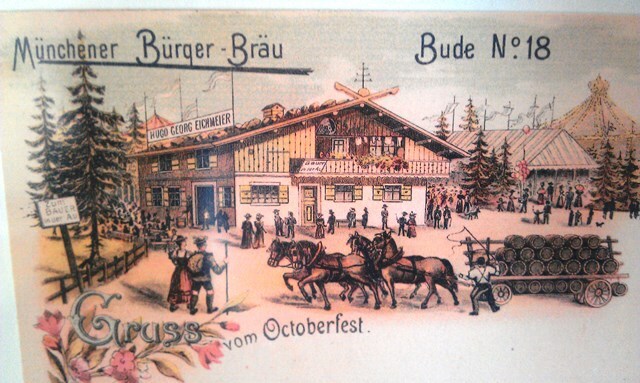 None of the tents featured it as the default festbier. 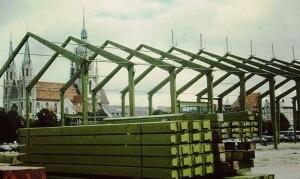 You could get it on request at only a couple of tents and from the wood—if you knew to beg—at Augustiner. The modern Oktoberfest beer is still stronger than average – approaching 6.0, not far off from the low range of IPAs== and is matured for longer than the average beers, although that lagering period seems to be shrinking for some of them. We don’t believe you can find the American import Spaten Oktoberfest, or anything like it, at any of the tents in today’s Oktoberfest. Rather than authenticity, it’s best to focus on the fact that it’s a living historical relic, preserved by American demand for a beer that’s no longer served at the fair. Tasting notes: It’s a dark caramel amber, neither as dark not as sweet as most Munich dunkels, but not that far off either. It starts with roast caramel, but a brace of noble hops almost creates a balance in the finish before the caramel takes back over into the aftertaste. That kiss of hops, though, makes it just moreish enough to get through the first liter. After that, at 5.9%, your judgment begins to cloud and your enthusiasm for your surroundings carries you through as many more liters as you….want. The 2017 Oktoberfest has wrapped up, and you’ll have to wait until next September 27 to enter the next tent. This year 6.2 million visitors guzzled 7.5 million liters of beer. Every serious beer drinker we know wishes she could have been in Munich recently for Oktoberfest. Except for those who have, in fact, attended the event. I don’t know anyone who centers his life around making a yearly pilgrimage. It is in many ways the biggest, baddest, most spectacular beer event in the world, but it’s also a touristy, loud, pricy extravagance. There’s a parallel in the world of baseball. Ellie and I usually attend a few Washington Nationals game every year and we’ve been to several playoff games. On our last visit, a nearly hour long wait for a slice of pizza and a craft beer reminded me why we only made it to one game this year and we will be watching the postseason on HDTV. We go to quite a few minor league games, however; shorter lines and closer seats give us a fine baseball experience with few hassles and less expense. 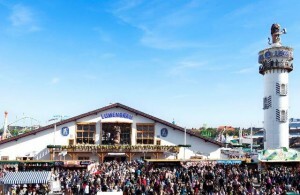 The “minor league” experience in the world of Oktoberfest are the myriad of local festivals throughout Bavaria during spring, summer, and most of the fall. A bit of digging on line can produce a wealth of options. These fests are smaller, though the biggest provide more food, drink, rides and entertainment than a person can consume in a day. 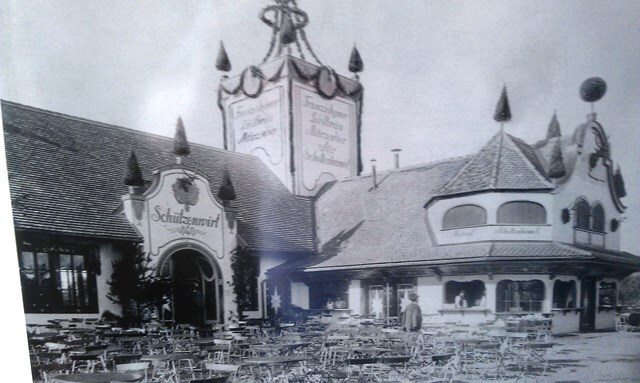 The largest, in Stuttgart, is substantially larger in area than the Munich fest that ends a few days earlier. Plan on more than one day. There are 14 distinctive massive tents – the smallest holds 5,000 people. Visiting only one is like seeing one movie and thinking you’re a film critic. There are 21 smaller tents, some with exceptional food choices, that are quieter and sometimes easier to get into. Even the smallest have some sort of music. St. Paul’s Church in the background had to be rebuilt after WWII, but the massive Oktoberfest tents are rebuilt every year. 2. Get reservations for the tents if you can. You would think the 100,000 seats, give or take, would provide plenty of room, but remember there are up to six million visitors vying for them. But there’s a catch: reservations are only given to groups of ten. The reservation is free, but you have to pay for 20 liters of beer and 10 chickens in advance. Reserve by contacting the individual tents by fax or letter in the late winter or spring. You can show up with lest than 10 people; the tent owner has already gotten your money for food and drink. Waiters will usually ask to seat people at any vacancies you provide, so you’re usually not buying extra elbow room. Often, left-over vouchers can be used at the tent owner’s restaurant in town for a while even after the fest is over. Next time we go, the plan is to reserve a table and find six or eight “new best friends” at our hotel to join us. Of course these people wouldn’t allow us to shoulder all the expense — they’re our best friends, after all. We’re pretty sure that this would avoid the prohibition on “resale” of reservations: they have metal detectors, not lie detectors at the gate. 3. If you go early enough, especially on a weekday, you have a chance of getting seats without a reservation. Each tent is required to keep some seats reservation-free, but they don’t keep many and they go very early. A group of two has a much better chance than a larger group. Singles, especially single women, can sometimes get into tents that are “full.” On weekends tents sometimes close as early as 11:00AM when they reach capacity and most tents are sold out most of the day. If it rains, the tents fill quickly and stay filled. 4. If your hotel has a concierge – and all the big ones do—he might have secured a table or two for hotel guests. You’ll still have to may the minimum consumption fee, but you’ll have a seat. 5. If you hit a heat wave, stop grousing and be thankful that you’ll be able to find seats much more easily. The beer will still be cold and fresh. The sunnier the weather the more people will use the gardens outside the tents and the greater likelihood that you’ll be able to snag seats inside. The gardens, by the way, are never reserved, often have room, and the music inside is piped outside. 6. Make room reservations early. Airbnb saves you from having to book a hotel in a city 100 km away or pay $400 to $600 or more for an ordinary hotel room. Especially towards the end, spaces open up both inside and outside the festival. We found dozens of rooms on Airb&b’s website for about $100 a night for the last two days of the fest. If you really want a hotel, Nuremburg is barely over an hour away by train and Augsburg is even closer. Both cities have lots of hotels. Suburban villages 30 to 40 minutes outside of town have guest houses and the area around the airport is awash with hotels. The Freising Marriott, for example had rooms open for the last two days at about $250 a night – not much more than you’d pay during other times of the year. The fest is easily accessible by UBahn from the main station. 7. The 10:30 last call in the beer tents can be shocking for residents of anywhere but Bavaria. The wine tent serves beer until just after midnight, but…it’s a wine tent. But rejoice – the after party rocks the Park Café, a beer garden that’s a ten minute walk from the main station (or one stop on bus 100.) The Park is in the old botanical garden and is worth a visit on its own. 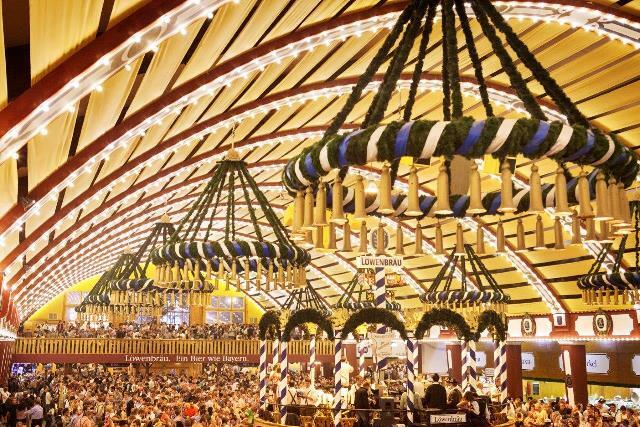 Alternatively, Lowenbrau turns the entire top floor of their massive beer hall into a “Wiesnzelt“ am Stiglmaierplatz” designed to authentically replicate the experience of being in their tent in the wiesn. The party also spills over into many of the city’s late night drinking spots. 8. Want to dress for the occasion? Stalls in the fest will sell you almost any kind of clothing but you can save a bucket of Euros with a visit to Resale – a used trachten store just off the Marianplatz in the direction of St. Peter’s cathedral. Grüß Gott = literally God’s Greeting or Blessing, but in Bavaria, it’s “Hello”. Convenient because it’s OK at any time of the day or night. Noch Ein Bier = One more beer. Most backpacks are banned. Expect security to be very tight, but security lines have been tolerable. It’s fine to bring the kids – there are more rides than in Disneyland—but the little ones have to clear the beer tents by 8PM when things can start to get rowdy. The beer taps flow no later than 10:30, though a couple of wine tents stay open later. Smoking is now banned inside the tents (a mercy, believe us). If you’re in a men’s room and see a chest-high urinal with handles on the sides, it’s not for basketball players. The fair used to have walls with porthole-like cutouts to use as a vomitorium. Hooray for the progress of man. Next year’s dates (2018) are September 22 to October 7.